"Exquisitively acted" was the Maltese Times verdict on this recent 60 minute lunchtime theatre production in which William Congreve (played by English actor, Philip Prichard) introduced G.F.Handel (German-speaking actor Robert Eliot) to his public. The show, which was specially commissioned by St James Centre for Creativity, was performed on May 21 & 22 2002 as part of Malta's "Celebrating Handel" week. Drawing almost entirely on original 18th century material "Mr Handel ... and Mr Congreve" nevertheless managed some contemporary interpolations. "Why you eh?" Congreve asks Handel at one point. "Why Handel and not Congreve?" for it is true that the kudos for "Semele" , one of the greatest English operas ever written, has gone to G.F.Handel while William Congreve, the librettist who was dead by the time it was performed, is all but forgotten outside the British Isles. With a bravurra performance from Robert Eliot as Handel and some deft cynical asides from Philip Prichard the show was a great success. "Malta now has its Handel story" concluded The Times of Malta. 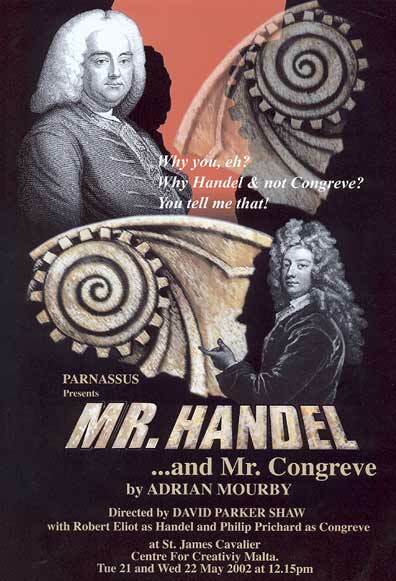 "MR HANDEL ... and Mr Congreve" was a Parnassus production directed by David Parker Shaw and written by Adrian Mourby. Both the script and the production are available for further performance.